Significant expansion is under way at Kunming Airport following the opening of the airport's new facility in Jun-2012. As the seventh largest airport in China by passenger numbers (50th in the world – larger than Barcelona El Prat, Boston or London Gatwick) and fourth largest by physical size, Kunming is the capital of expansive Yunnan province, a hub for tourism and a key gateway for South and Southeast Asia. LCC AirAsia has launched a new flight while Singapore Airlines subsidiary SilkAir has increased service. Kunming has organic O&D traffic flows but also great potential to be a hub for passengers going to Southeast Asia from either China or on long-haul sixth freedom flows Chinese carriers are increasingly targeting. China Eastern, which has a base in Kunming and is the largest carrier there, is mounting a rare aggressive expansion plan after primarily focusing on its merger and enhanced position in Shanghai. Private carriers Juneyao and Spring Airlines want to establish a base, but many are finding the airport is already running out of slots. Before the airport becomes mainstream, future entrants may be locked out. Kunming, a subtropical centre in the Mekong basin, situated close to Laos, Myanmar, Thailand and Vietnam, has a lot to offer. With a population of 6.5 million, it is a major mining, industrial and agricultural centre, with extensive tourism attractions. Culturally and economically it is closely linked to its Southeast Asian neighbours, with a rail line to Hanoi and Ho Chi Minh City and plans to expand surface links among its Mekong neighbours and to Singapore as part of a proposed "Iron Silk Road". Kunming received global attention in Jun-2012 as Wujiaba International Airport prepared to close to make way for its replacement, Kunming Changshui International Airport, designed with a futuristic space port look and golden-colour curved metal beams looping from the floor to a massive ceiling. The USD3.6 billion airport was opened with a delay of a few months and an initial handling capacity of 25 million passengers per annum, up from Wujiaba's 20m p/a; but this is expected to rise – with additional terminal and runway expansion – to 38m passengers, 303,000 flights and 950,000t of cargo by 2020. The long-term objective is for the airport to handle 65m passengers and 456,000 flights p/a. Kunming has taken the rank of fourth largest airport by physical size after Beijing, Shanghai Pudong and Guangzhou with its 23,500m² terminal building and a 90,000m² car park. But in terms of passenger numbers, Kunming is the seventh largest in China – but still bigger than airports at Johannesburg, Washington Dulles or Zurich. Looking only at domestic capacity, Kunming is the sixth largest. For only international capacity, Kunming is eighth largest. In 2011 it was in the middle of the spectrum of airport size versus growth rate: smaller than Beijing Capital and Shanghai Pudong but growing faster than them. 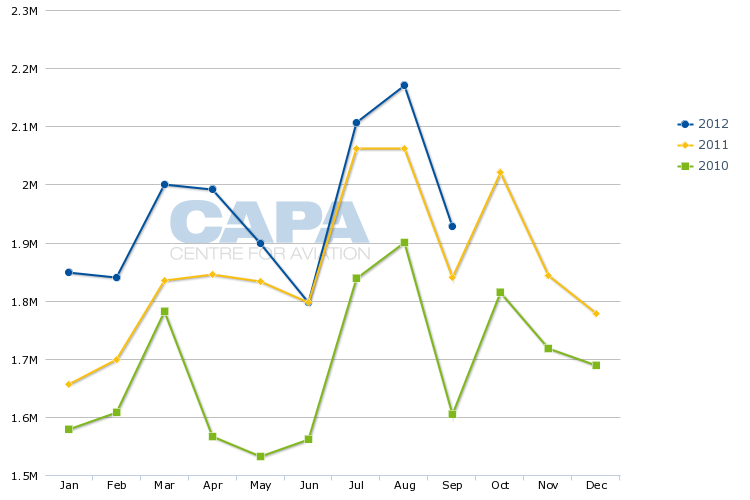 Traffic in 2012 has generally been up beyond 2011 levels, except in Jun-2012 when airlines decreased capacity during the transfer between airport facilities. Traffic growth has been more moderate, however, with the airport not seeing the monthly double-digit percentage growth gains as it frequently saw in 2011, although this is more a reflection of limits on slots than potential. The airport averages about 40 movements an hour each day during peak hours, but airlines are reporting that gaining additional slots is becoming increasingly difficult. Official reasons are not clear, but are more likely to do with air traffic congestion – the ATC is controlled by the military and only a fraction of available airspace is opened to civilian flights – than limits on the airport, seeing it is still above capacity. Kunming is primarily a domestic airport, with 94% of seat capacity allocated to the domestic market. International services are confined to Asia and the Middle East; the farthest-flung routes are to Dubai and Osaka. China Eastern has a substantial operation at Kunming, accounting for 44% of all seats. That is slightly lower than the 52% share it and wholly-owned subsidiary Shanghai Airlines have at home in Shanghai Hongqiao. Rival Air China has a western hub at the similar sized Chengdu Airport, but is not so dominant: Air China only accounts for 32% of capacity in Chengdu. Homegrown carrier Kunming Airlines is up and coming at Kunming. The carrier is 80% owned by Shenzhen Airlines, which in turn is 51% owned by Air China. The relationship effectively allows Air China to compete against China Eastern through Kunming Airlines, which in Nov-2012 received its 10th aircraft, a Boeing 737 wet-leased from Shenzhen Airlines. Kunming Airlines is an entirely domestic carrier serving 26 points, almost all to/from Kunming. 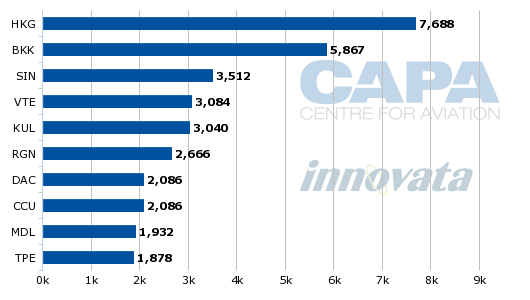 It is still only a minnow in China, being the 18th largest carrier ranked on domestic capacity. China Eastern is more exposed internationally, accounting for 50% of international seats from Kunming. 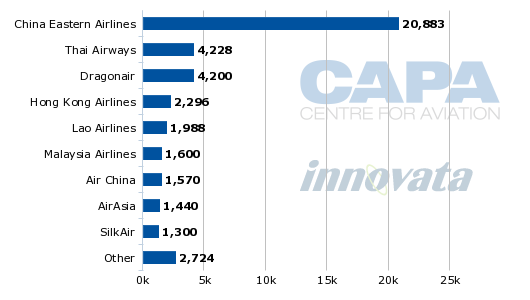 The next largest carriers, by a considerable distance, are Thai Airways and Dragonair. 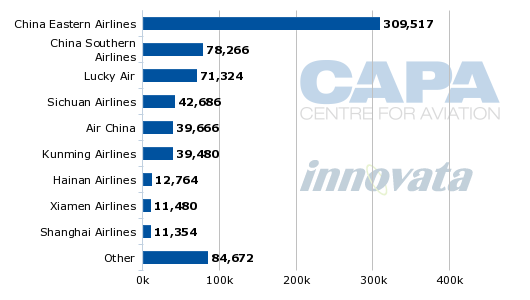 The only other Chinese carrier with notable international capacity is Air China. 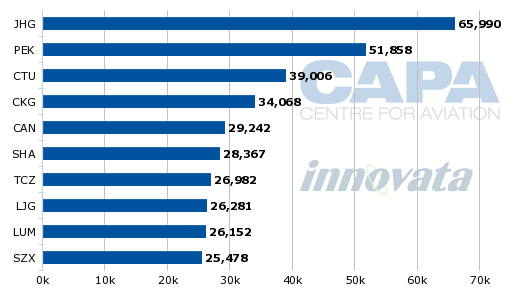 No international carrier ranks in the top 10 for overall capacity to Kunming. International seats are predictably most heavily directed to Southeast Asia and then Northeast Asia. Top destinations for international seats largely correspond to the largest international carriers, with Hong Kong – home to Dragonair and Hong Kong Airlines – taking the top spot, followed by Bangkok, the base for Thai Airways. Domestically the top routes are primarily to coastal cities, as is typical for Chinese airports. Coastal cities were the first to experience China's accelerated growth and wealth. About 85% of all seats at Kunming are supplied by full-service carriers. 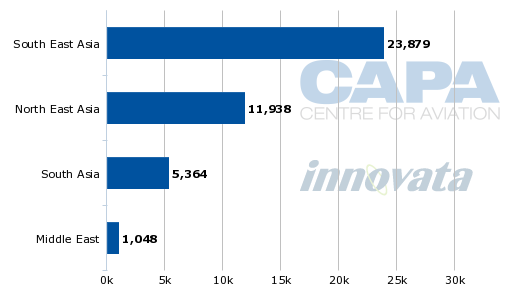 LCCs are yet to make significant inroads, accounting only for about 13% of total seats. In light of the already well-established surface links and trade potential, it would seem likely that low-cost airline operations could prosper. The city is part of the ASEAN open skies regime, allowing service between ASEAN non-metros and Chinese cities outside Beijing, Shanghai and Guangzhou. 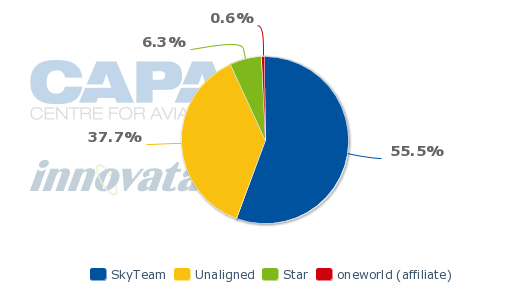 Reflecting the heavy presence of China Eastern, a member of the SkyTeam alliance, SkyTeam accounts for 56% of capacity while Star has a sliver at 6% and oneworld (via Draongair's services) less than 1%. 38% of capacity is unaligned. Both Juneyao Airlines and Spring Airlines have expressed interest in establishing bases at Kunming. Kunming would be the first base outside of its home market for Juneyao, whereas Spring already has bases at Shenyang and Shijiazhuang. Both carriers hail from Shanghai (with operations at both Hongqiao and Pudong airports) and were formed during the wave of start-ups during the relatively liberal period mid last decade when China permitted private capital carriers to establish themselves. Juneyao and Spring are the most successful of that tranche, and also some of the few still in business. They have each grown rapidly, amassing about 30 A320 aircraft each, but with different models: Spring is low-cost (China's only) while Juneyao, although operated along high efficiency lines, targets the high-end leisure and premium passenger as well as budget travellers. Both have succeeded due to the high wealth concentration around Shanghai, China's financial capital, and their agility compared to their legacy counterparts. Spring's model has more universal appeal whereas Juneyao faces a test, transplanting its model to a new city. But overall Chinese airline growth is tightly controlled with government limits on aircraft imports, potentially meaning any carrier with capacity should succeed since Beijing ensures capacity growth is matched closely to demand rather than allow free market principles – with their associated downside, such as rapid expansion and possible collapse – take over. Spring sees a potential Kunming base as enabling it to serve India and West Asia. While Southeast Asia is also accessible from Kunming, Spring is considering a base at Guangzhou to tap into that market, although slots at Guangzhou are also difficult to come by. Kunming's domestic focus is slowly shifting with new foreign carriers and increased services, although domestic flights will continue to represent the vast majority of capacity for some time to come. Unsurprisingly, new and expanded services are primarily to Southeast Asia. AirAsia became the first Southeast Asian LCC to enter Kunming with a four times weekly A320 service from Kuala Lumpur. 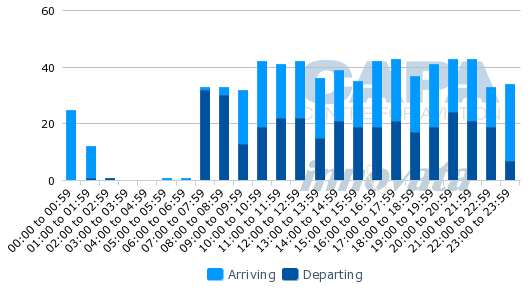 According to local reports, AirAsia operated the inaugural service with a 98% load and an 86% load on the return flight. The carrier opened reservations for the service on 22-Oct-2012 and is expecting load factors of around 60% over the next three months. AirAsia is now considering serving Kunming from Bangkok using subsidiary Thai AirAsia. AirAsia is looking to gain scale across its network by having subsidiaires fly to common points. SilkAir, the regional full-service subsidiary of Singapore Airlines that entered the Kunming market in 1993, on 29-Oct-2012 increased Singapore-Kunming frequency from three to five times weekly A320 flights. Dragonair, Cathay Pacific's full-service regional subsidiary, up-gauged capacity earlier in 2012. Orient Thai, a secondary and primarily leisure-focused carrier in Thailand, opened three times weekly Bangkok-Kunming service with 737 equipment on 14-Jul-2012. There have been causalities, with Vietnam Airlines cancelling five times weekly Hanoi-Kunming service at the end of Mar-2012. An imminent new entrant could be SriLankan Airlines, which in Jun-2012 stated it was seriously considering Kunming. Also a possibility is Lao Central Airlines (LCA), which commenced operations in May-2012. The carrier is seeking to increase both its international and domestic traffic from Laos, where it is the country's first private airline. The full-service airline operates Vientiane-Bangkok service and Vientiane-Luang Prabang service using 168-seat Boeing 737-400 equipment. In addition to planning to expand its international network to Kunming – the only Chinese city under consideration – other planned points for LCA include Hanoi, Phnom Penh and Yangon as well as launch additional domestic routes. The airline’s first three of nine Sukhoi SSJ100 aircraft are to arrive by the end of 2012 while it also plans to acquire larger aircraft for its international network. LCA is aiming to become the preferred airline in Laos by 2015 and to increase its profile. Beijing-Kunming-Vientiane: Increase from four times weekly to daily from 28-Oct-2012. China Eastern has also flagged interest in serving Vietnam's Da Nang and will expand Kunming-Siem Reap services from five times weekly to daily with Boeing 737 aircraft on 03-Jan-2013. The China-Vietnam market is poised for rapid growth, but Vietnamese carriers – including start-up LCC VietJet – are primarily focusing on the domestic market for now. Expansion earlier in 2012 included launching three times weekly Kunming-Chiang Rai service with Bombardier CRJ equipment from 07-Feb-2012 and adding a fourth weekly Kunming-Chiang Mai frequency from 12-Feb-2012. Kunming-Taipei through Mar-2013 will see a seasonal up-gauge to A330 equipment. Kunming noticeably lacks a long-haul service. This will undoubtedly change, but the timing is uncertain. The region is a centre for Southeast Asia, and its mineral resources, heavy industry and business in general could attract intercontinental passengers. 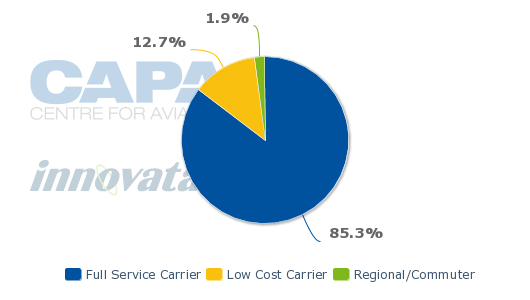 A Chinese carrier service may be the more likely operator. A plausible service could also be from China Eastern to Australia. Although China Eastern is not as bullish about Australia as its Guangzhou-based competitor, it has recently announced its intention to open Nanking-Sydney services, its first Australian service from a city other than Shanghai. But China Eastern has many expansion plans and limited aircraft, making it likely that Kunming will continue to grow across Southeast Asia before intercontinental flights emerge. There are also growing prospects for more South Asia services. Indian destinations are few but with a little imagination there is room for expansion. Chinese carriers, aside from Juneyao and Spring, lack agility, but have the government on their side, awarding them with favorable slots. Others will need to be fast to enter the market, as AirAsia has done, or carriers may find themselves in the same position as exists in Beijing, Guangzhou and Shanghai: slots run out just as carriers begin to give the city their attention. Moving early may mean initial weak performance, but China is a unique market with few signs of positive structural changes – airspace reform, transparent rules – meaning that long-term success has to come before short-term priorities. In the longer term, as the airport grows, Kunming shows all the signs of migrating to a role as a major short and long-haul hub.